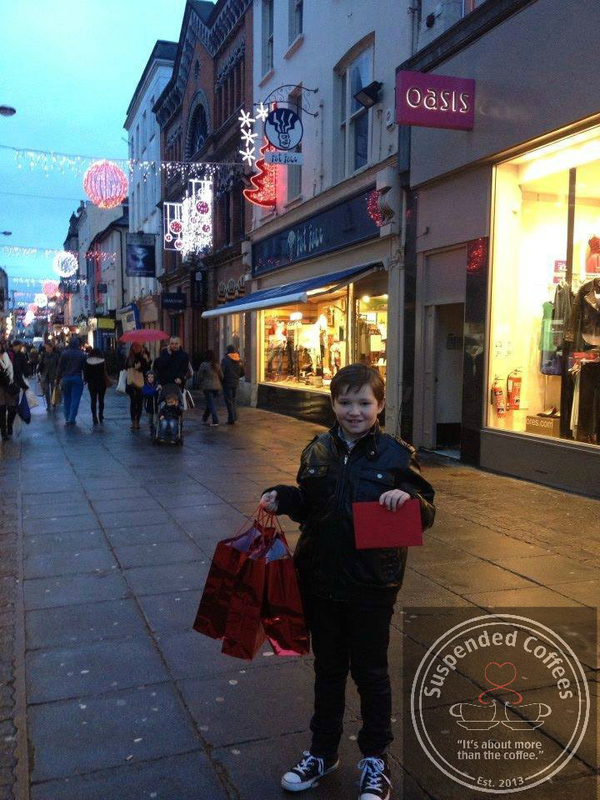 HOMELESS – This is Cork schoolboy Isaac. He went that extra mile in Cork city, Ireland at the weekend and stopped to chat with a homeless young lady, bought her a burger and then shopped for Christmas gifts for her 3 very young children. Issac did this with his very own pocket money. The homeless lady was in tears. His Mom Imelda, is a very good friends with Suspended Coffees founder John and was so inspired by what he is doing she decided to take part. He’s what she had to say.. Very proud of my Isaac. Yesterday he went that extra mile in Cork city and stopped to chat with a homeless young lady, bought her a burger and then shopped for Christmas gifts for her 3 very young children. It was incredibly emotional as he handed over the gifts and Xmas card to her. She held our hands and sobbed her heart out. Isaac said it was the 1st time he ever truly witnessed someone crying with gratitude and he felt a joy he never knew before. I am so thankful for that experience yesterday and am not sharing this to brag but rather to share a piece of Christmas joy. Isaac and I were inspired by our good friend John Sweeney and his Suspended Coffees movement and now we hope others will also be inspired and partake in a simple random act of kindness this Christmas. Cork city was full of homeless people yesterday. It was so sad to see. Yet we feel blessed to have met a lovely lady who shared a piece of her story with us. I’ve used Issac’s story at my recent TEDx talk which you can view here.